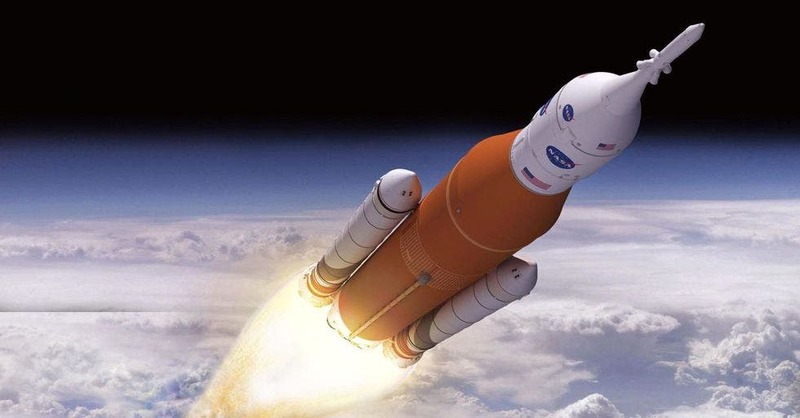 Artist impression of SLS. Credit: NASA. Looking forward to NASA’s highly-touted Space Launch System (SLS) to head into the void ferrying humans at its tip for a moon shot? Well, you might have to wait (again). According to NASA administrator Jim Bridenstine, they could end up launching the Orion Multi-Purpose Crew Vehicle aboard a commercial rocket. The space agency had originally limited commercial partners to low-Earth orbit, but thanks to technical delays, that restriction will be lifted. “We’re now understanding better how difficult this project is and that it’s going to require some additional time,” NASA Administrator Jim Bridenstine told the Senate Committee on Commerce, Science and Transportation at a March 13 hearing. While Bridenstine says that no other commercial vehicle can currently lift the Orion capsule to deep space, the most likely picks would be SpaceX’s Falcon Heavy — which is expected to make its next launch in the first week of April for a second Crew Dragon liftoff — or the Delta IV heavy — which launched the Orion on a test flight in December 2014. A Falcon Heavy can send nearly 141,000 pounds to low-Earth orbit, while a Delta IV can carry 62,540 pounds. Theoretically, the SLS could delivery 209,000 pounds. According to the NASA administrator, the mission using a commercial lift would most likely involve multiple phases. The first would involve a rocket sending Orion and the European Space Agency Module — the service module component of the Orion which would serve as its primary power and propulsion component — around the Earth. The second phase would consist of another rocket launching an upper stage separately. That rocket would then meet up with the existing modules to boost them to the moon. Originally slated to make its maiden voyage in 2017, dubbed Exploration Mission 1, the SLS had to have that flight pushed to June 2020, or beyond. So far, the SLS has also racked up expenses to the tune of an estimated $14 billion. However, Bridenstine says not to count the SLS out just yet. “I believe in the strength of our workforce and our ability to utilize every tool available to achieve our objectives. Our goal is to get to the Moon sustainably and on to Mars. With your focused efforts, and unmatched talent, the possibility of achieving this objective is real.